This was a new satellite installation. 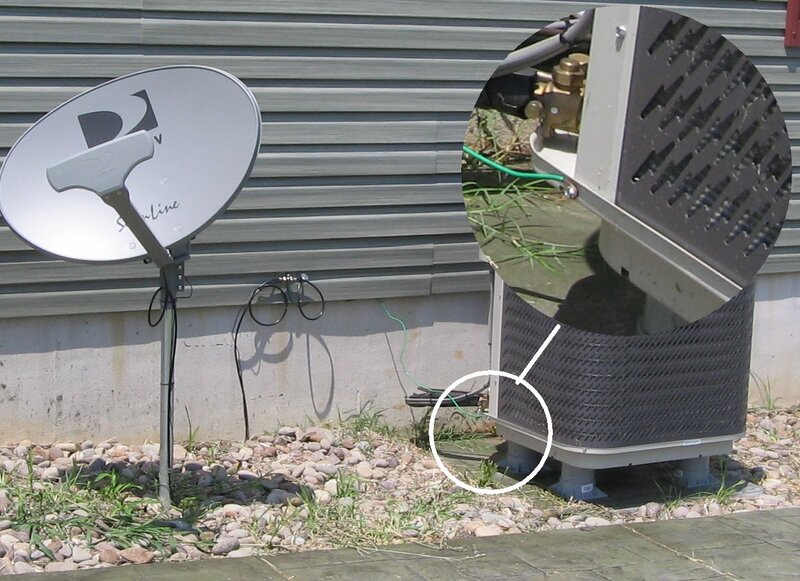 Note the whole thing is bonded to the HVAC condenser, with a sheet metal screw, at the opposite end of the house as the grounding electrode system. There is no other bonding. That's the HVAC without the disco! Dish guy may also have installed the AC! There are actually 2 HVAC systems in This house. Neither have discos. This is not the same one as the other picture. I forgot to look to see if the thermostat cable was UV protected. It doesn't even look like a very effective bond either. A few months of vibration from that A/C unit and that wire will be sitting in the dirt. The bonding path is so long that the TV will be smoking long before the spike gets shunted out. From my experience in the lightning biz we found you want to have the bonding path shorter than the signal path. The shorter the better. Earthing of TV aerials or satellite dishes is a rarity in Australia. I've never seen or worked on an installation where there has been a separate earthing conductor. The only earthing is by default either by a distribution amplifier or TV with a three core mains cable. Virtually all Australian made TV sets had a transformer isolated and earthed chassis; hence the aerial would be earthed by the power mains via the ribbon or coax, so it was a matter that no one really gave much consideration to. These days, with all the two core mains leads and switchmode power supplies with all their capacitive leakage, an aerial system can have enough voltage superimposed upon it to give a bit of a tingle. The more TV's, DVD players etc., connected to the system the worse it gets. And the lack or earthing on these appliances means lots of RFI radiated from their cheap power supplies. I have a hard disc recorder that ruins AM radio reception which was so easily fixed by connecting a clip lead between it and the metal case of a earthed appliance. Now it's out of warranty, the mains cable will be replaced with three core flex and the concentric squares on the back removed. Double insulation first came out with power tools; that's where it should stay.